This Presentation date is February 20, 2014 at 8:00 - 10:00 local time. NFV has joined SDN in becoming a constant topic of discussion among customers, media, and others. Kelly outlines Brocade’s perspective on what is really happening, where the adoption is occurring, and the next barriers to be removed, as well as the role of the Brocade Vyatta vRouter. As chairman of the Technical Steering Committee (TSC), David will discuss the progress made in a year’s time, what’s included in the Hydrogen release, and what’s coming in the next release, Helium. 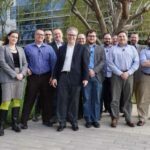 What’s New at the Open Networking Foundation ONF? Forward Abstraction Work Group (FAWG) chair Curt Beckmann provides his usual “straight talk” overview of Open Networking Foundation initiatives and Brocade’s work within the organization. The always traveling Jon Hudson shares stories from the road, specifically what customers are saying about SDN and NFV. Additionally, he will weave in updates from other organizations, such as IETF. Practical SDN: How Do We Get There From Here? David, Curt, and Jon sit down for an interactive discussion around a number of topics related to SDN, how to overcome barriers to adoption, and where other emerging technologies fit (i.e. NFV). Ramki discusses the novel real-time SDN/NFV network analytics applications for DDoS detection/mitigation which treat long-lived large flows separately from other flows at Layer 4 level and enable operators to offer value added services.